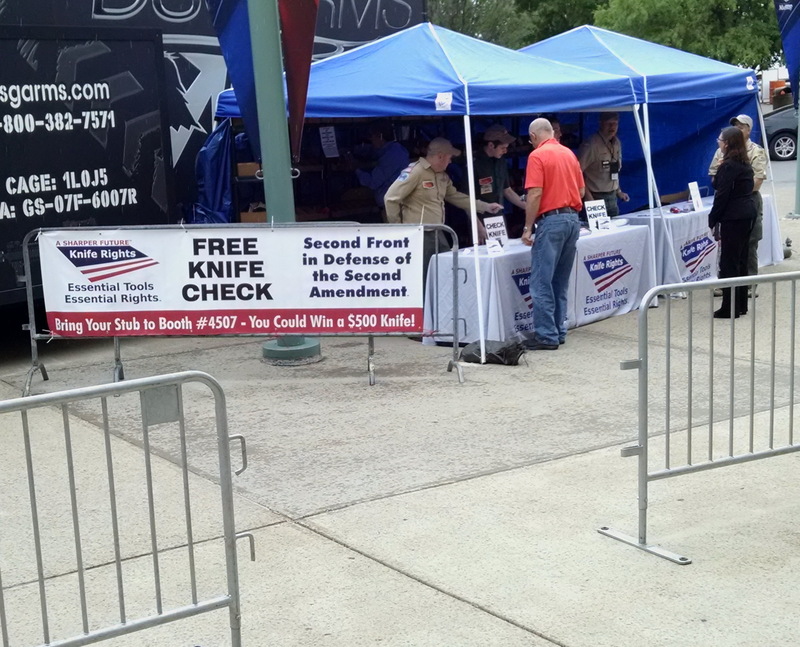 May 21, 2016 – Louisville, KY: Knife Rights was proud to be able to assist 2,600 knife-carrying NRA members at the NRA Annual Meeting by providing a Free Knife Check for those attending Friday’s NRA-ILA Leadership Forum. 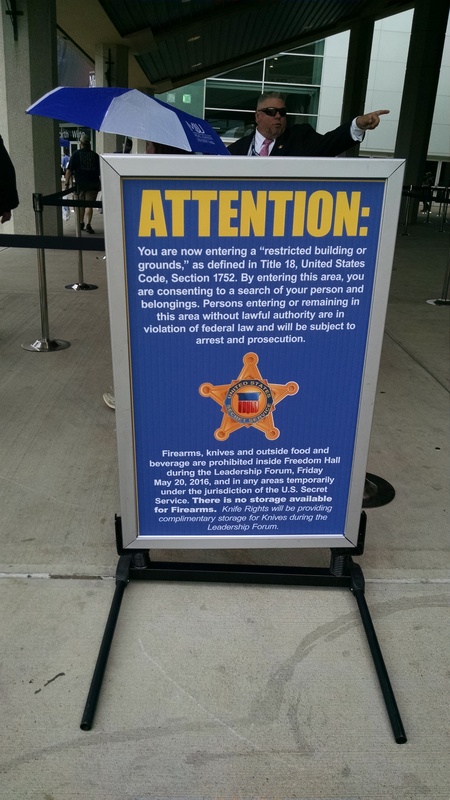 Because the event featured presumptive Republican Presidential Nominee Donald Trump, the Secret Service instituted security checks for all who attended, including metal detector screening. 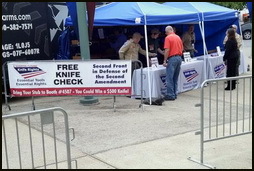 In cooperation with NRA and with the able assistance of Leaders and Scouts from the Lincoln Heritage Council, Boy Scouts of America, Knife Rights provided a free Knife Check where NRA members could drop off their knives before screening. 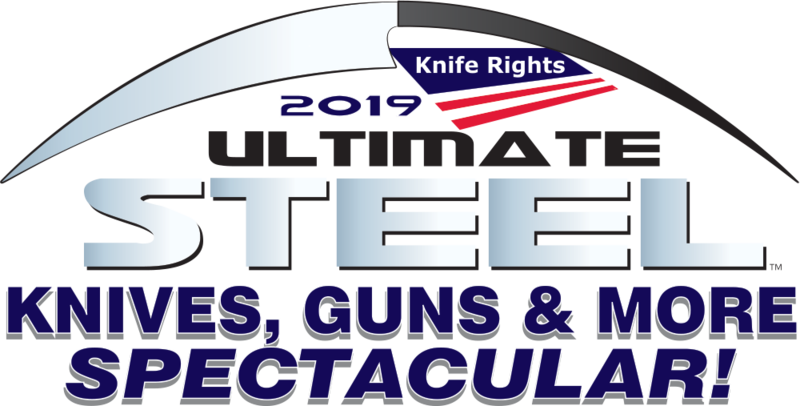 Each NRA member that checked a knife also had the opportunity to win a $500 Custom Damascus Hogue EX-04 3.5″ Wharncliffe Blade with G-Mascus Blue Lava G10 handle, generously donated by Hogue Knives. The blade was hand crafted, hand ground, and hand honed by knifemaker and designer Allen Elishewitz. Second prize was a $250 Benchmade Amicus knife, generously donated by Benchmade Knife Co. Knife Rights (www.KnifeRights.org) is America’s grassroots knife owners organization, forging a Sharper Future™ for all knife owners. Knife Rights is dedicated to providing knife owners an effective voice to influence public policy. In the past six years, Knife Rights has passed pro-knife legislation repealing knife bans in 15 states, stopped anti-knife legislation in 8 states. Knife Rights is also leading a federal civil rights lawsuit against New York City and the New York District Attorney over their persecution of knife owners. Knife Rights is the Second Front in Defense of the Second Amendment™.